Play if… you like the Flintstones and fuzzy pelts. Avoid if… you’ve ever been worried about being eaten first in a situation where cannibalism is in play. Description (from the company website): You and your buddies are prehistoric cavemen in 6,000 BC. Your group encountered a hostile tribe of cannibal cavemen. They’ve taken you back to their lair where you are being held captive. The tribe is out hunting but will be back before the Sun sets. You have 60 minutes to escape or become caveman chowder. Description of the room: You start off in a tribal campground locked in a cage. Did the room challenge the entire team? Yes, but space – at times – limited the number of people who could work on the different puzzles. Members of our team (other than the ERG): David, Tara and Steph. Team Disturbed Friends (David, Tara, Jason, Steph and Mike) avoided becoming caveman chowder! Photo courtesy of PanIQ Escape Room. Never, EVER drink the KOOL-AID™!! 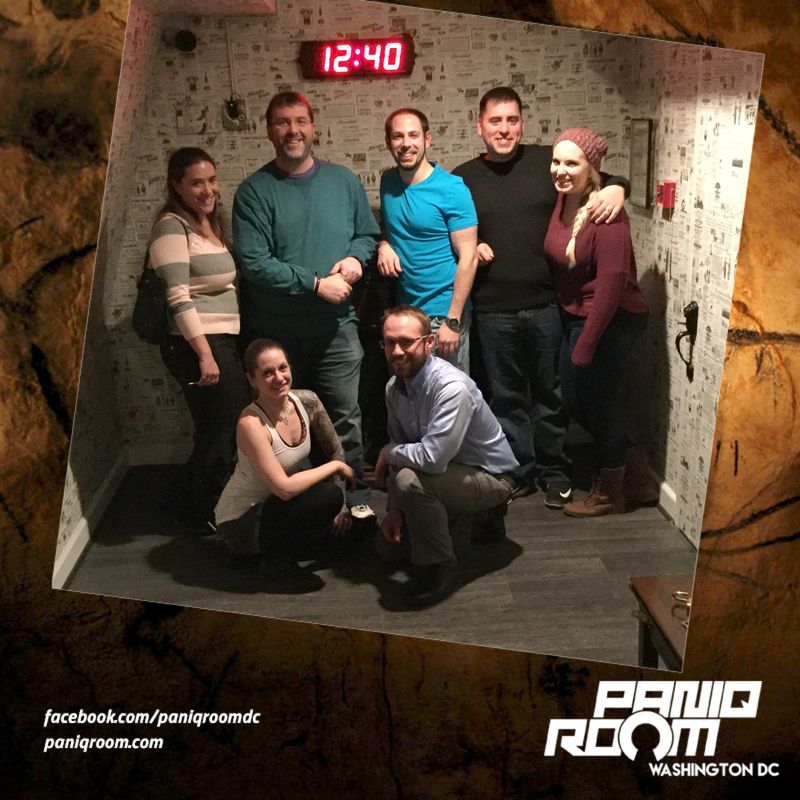 – Room: Insane Asylum II – Saturday, March 25 – FAILED! 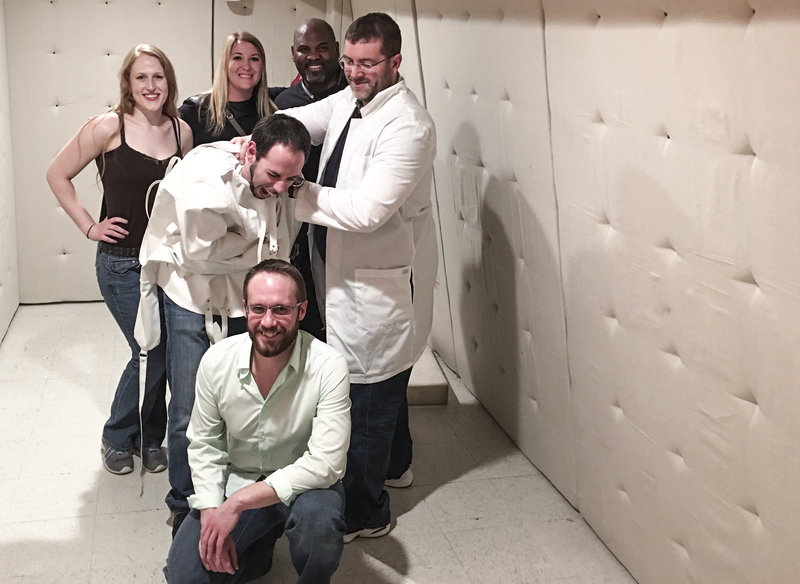 Play if… you’ve ever wanted to experience being in a padded cell (without being actually committed). Avoid if… you are all thumbs. Description (from the company website): The year is 1956. You have been kidnapped by the CIA and are being used as a guinea-pig for their mind control program known as MK-ULTRA. Doctors have held you inside a padded room for weeks now. There was an emergency at the other side of the institution, so the staff is gone for a while. Probably this is your last chance to escape before they completely brainwash you. Staging Area: First, ring doorbell to gain entry. Rooms are on the 3rd floor of the building. Small waiting area with couches and water cooler. Enough space for one team to hang out while they wait, but additional seating in stairwell area. Metro Access/Parking: Rosslyn metro and then a .9 mile walk across the Key Bridge. It’s Georgetown, so parking can be difficult (so definitely carpool and use the parking garage for Georgetown Mall (it’s open 24 hours) at Wisconsin and M, head down the hill towards K Street). We suggest Uber or Lyft. Description of the room: You enter a padded cell. Clearly the person who inhabited the room has gone a little loco. Understanding of the Mission: Solve the clues and figure out how to escape the cell before the asylum’s staff returns. You are close to being brainwashed and this is your last chance to escape before they succeed and you become a mindless drone in their spy program. Time Remaining: Less than 0. Our Suggested Party Size: We had 6 and that worked well. We could have added a seventh and it would have been fine. We don’t suggest any less than 4 because there is a lot to do. Team Disturbed Friends (Eric, Jason, Mike, Liz, Jill and Alphonzo) ended up being committed to the Asylum after failing to escape! 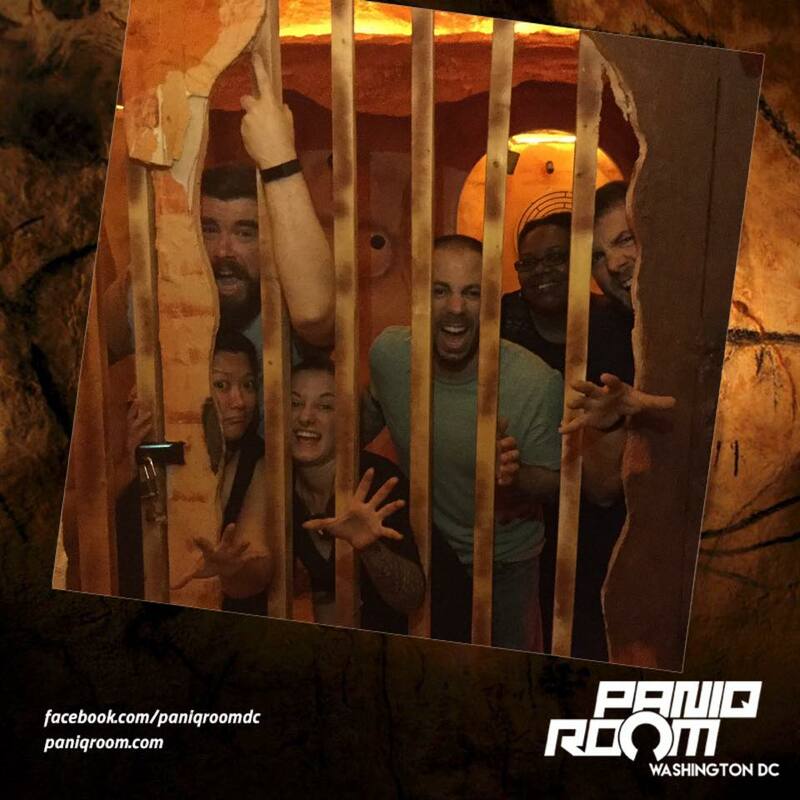 Photo courtesy of PanIQ Escape Room DC. Worth the time and money? Hell yes, even though we failed. El Centro D.F. – upscale Mexican cuisine – we stopped in for chips and guac, tacos, and margaritas to drink our sorrows away.